Dessert Alert! 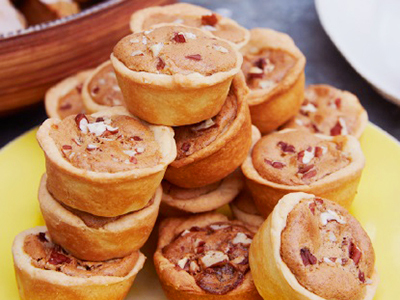 Put smiles on the faces around your dinner table after a big meal with these tasty Mini Pecan Tarts. 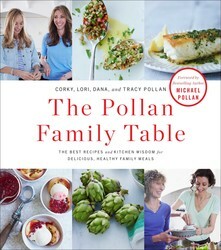 From The Pollan Family Table. *You will need a mini-muffin pan or pans that will hold a total of 24 tarts. Combine the cream cheese and 8 tablespoons of butter in a large mixing bowl and mix with a wooden spoon until thoroughly blended. Add the flour and continue mixing until the dough comes together. Form it into a ball, flatten the top, wrap it in plastic and place it in the refrigerator for 1 hour. Set a rack in the middle of the oven and preheat the oven to 325˚F. Set aside an ungreased mini muffin pan or pans that will hold a total of 24 tarts. Using an electric hand mixer or a stand mixer, combine the egg, brown sugar, 1 tablespoon of butter, vanilla, and salt. Beat until smooth, 2 to 3 minutes. Set aside. Remove the dough from the refrigerator and shape it into 24 one-inch balls. Place a ball in each muffin cup, and with your fingers press out the dough to completely line the bottom and sides of the cup. Evenly distribute 1/3 cup of the pecans in the pastry-lined cups. Add about 1 teaspoon of filling to each cup and top with the remaining nuts. Place the pan(s) in the middle of the oven and bake until the filling is set and the crust is browned, 25 to 30 minutes. To ensure even baking, rotate the pan(s) top to bottom and front to back halfway through. Let the tarts cool in the pan on a wire cooling rack. Arrange the tarts on a platter and serve.